Joseph Anthony Gallagher (Joe) Age 90, passed away peacefully in his sleep on November 5th, 2018. Joe was ready to join his buddy and wife whom preceded him in death on June 23, 2018. Survived by sons Stephen (Pam), Sean (Jill), Michael (Judy), daughter Mary (Ken) Barnett, Step daughter Brenda Stagg and stepson Robert (T’Onna) Stagg. He leaves many grandchildren, step grandchildren and great grandchildren. He was preceded in death by his wife Joan Stagg-Gallagher, parents Anthony and Berlie, brother’s Harold and Denver, grandson Adam and step son Amos Stagg. Joe was born in Belmont City, OH. Joe graduated from the American Baking Institute of Baking Technology in Akron, OH. He worked 32 years at A&P and after retirement from there he moved to Grand Rapids, MI to restructure and operate a bakery operation. When that was sold he started Executive Resources Int. a consulting company. Joe did several consulting jobs in the food management industry. Joe was selected by the government sponsored International Executive Service Corp to travel to numerous countries to assist with food management projects. Countries included Singapore, Malaysia, Zimbabwe , Russia and Ukraine. Joe enjoyed competitive shooting, hunting, golf, reading, and riding BMW motorcycles. He particularly enjoyed travel with his wife Joan including Europe by train, Baltic countries by cruise ship and exploring the USA by road in his Jayco conversion van. Joe felt he had completed his “bucket list”. 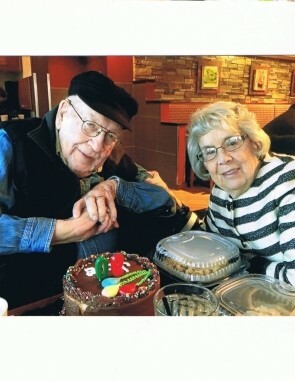 He was content in retirement and loved spending his time with wife Joan at the “cottage” on Lake Michigan. At Joe’s request there will be no ceremony.